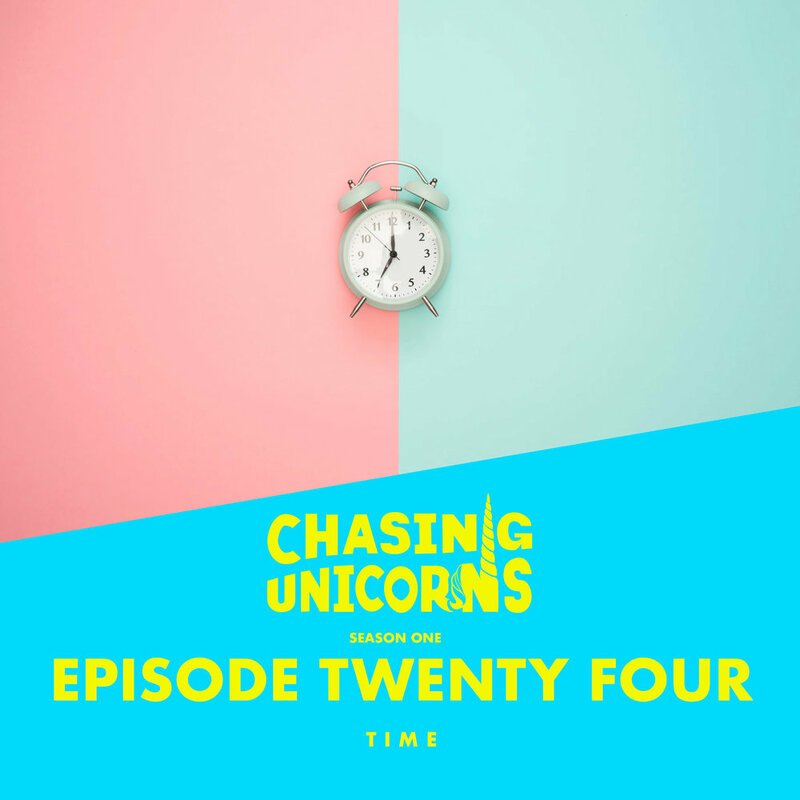 Welcome to Chasing Unicorns… a podcast about giving ourselves permission to follow our dreams, explore our faith, and figure out who we are, all while trying to keep our crap together! Yes we’re chasing our dreams, AND as Creatives, Humanitarians, and Parents, we’re also learning (sometimes the hard way) that the hustle and pursuit of the elusive unicorn will never satisfy. Welcome to Chasing Unicorns! Today we’re talking about Time—how it’s fleeting and how we can get more of it so we can actually be rich in our time. We’ll also talk about how to identify smart people, how the world is actually being repaired, and how the word ‘no’ can be a time and sanity saver. And most importantly, we’ll be announcing the winner of the Magical Chasing Unicorns Giveaway!!! Yeah, way to go! You’re a good mom and our kids are pretty lucky. He did look amazing, you can see a picture of him in all his glory and his center-parted hair on my personal Instagram, @DaveHansow. And Jadyn, on the other hand, had decided not to dress up for Halloween this year so instead of joining us for a low-key hang-out with some friends and some trick-or-treating, she opted to have a friend over and they binge watched Season 2 of ‘Stranger Things’ and ate candy and junk food at our house. We’ve had some great responses to last week’s podcast in which we talked about God, leaving room for doubt, and understanding that things get less black-and-white and more YesAnd you older you get. One person wrote in appreciating the honesty and saying that he too has the same doubts and he didn’t want the segment to end. Another person wrote in appreciating the vulnerability and personal approach so it seems like Episode 23 really resonated with a lot of people and it gave them permission to not feel alone in their doubts or questions when it comes to their Faith… and having conversations and greater depths of freedom is what we’re all about. In other news Dave, I came across this article in an old Inc. business magazine I was browsing through this past week and I wanted to share it with you because, well you’ll see why, haha! They’re anxious - worriers are more intelligent than those who are unaware of their flaws. Yep, so basically, I just selfishly wanted to share this with to justify myself, my clutter, my preference for a glass of wine a few nights each week, my occasional use of swear words when I’m trying to make a point, and my tendency to worry. It’s really because I’m just smart and creative! Haha! But really, you’re a wine drinker, and occasional swearer yourself, so you’re half as smart as me! You just need to get your clutter and worry on! Haha! Well… mine comes in the form of stats this week. VOX recently put out 23 maps and charts that actually show how drastically our world is improving, despite what it may feel like. So… I will put the link in the show notes and you should absolutely go check it out yourself because it’s amazing. But for now, I will read off a few of the most impressive things I found out. 1. Extreme poverty has dropped worldwide (which is defined as making less than $2 per day from nearly 35% of the world’s population in 1987, to under 11% in 2013…. And it’s only gone down since then. Child labor worldwide has had a 40% reduction from the year 2000, to 2016. Between 1960 and 2007, the percentage spent on food by Americans fell from 17.5% to 9.6 percent,” which apparently has been one of the major contributors to an increased economy. Basically if you free up that much money, you can spend it on other things that help others. Child mortality has fallen by more than half since 1990. If you look at developing regions, the gains are even more impressive. In Africa, 17 percent of children died before reaching age 5 in 1990. By 2015, that was down to 8 percent. Smoking is WAY down in developing countries. And the list could go on and and. Go check out this article the next time you think the world is falling apart… because it isn’t! We’re all aware of the tragic shooting at the Tree of Life Synagogue in Pittsburgh last Saturday where 11 people lost their life. The shooter was screaming anti-semitic and hateful words like, “Kill all the Jews,” which is just horrific and jacked up...the 46-year-old shooter, Robert Bowers, was shot several times and taken to nearby Pittsburgh's Allegheny General Hospital where many of the staff and doctors were Jewish. In fact the nurse who cared from him in the ambulance on the way to the hospital was Jewish and she cared for him as he continued to yell “I want to kill all Jews.” And the President of the hospital, Dr. Jeff Cohen who oversaw his care is a member of the Tree of Life Synagogue himself - even though this man just went into His place of worship and killed 11 people from his congregation, his comment when interviewed was this, he said, “My job isn’t to judge him, other people give that — that’s a pretty awesome responsibility. My job is to care for him.” Wow! The article I was reading also mentioned the Hebrew phrase of “Tikkun Olam”(Tee-koon O-laam) which is a phrase that roughly translates to “repairing the world.” Essentially, that acts of kindness that are performed will repair the world and that it’s our responsibility, our moral duty to be a part of repair our society and our world. I was really touched by this story - could I? Could I set aside judgment and love and save the life the man who just murdered my friends? I don’t know - I’d hope so, and that’s an extreme example, but it’s jolting to my heart (and it’s convicting—which it should be—because I’m not called to judge people and somehow with all our access to stories and news, we all think that judging others is our privilege). And even on a smaller scale, that’s our call, not to judge, but to repair the world… that’s what Jesus asked us to do every day...to take part in repairing this world through love and kindness. And that even applies to how we choose to engage (or abstain) from divisive debates or posting on social media or what we’re doing to help meet the needs of the people we perceive as ‘other’ or ‘enemies’ and right now - are we looking to judge or are we giving them our love and care even though the words they’re screaming may be in direct opposition to our beliefs or our very existence? Good food for thought and a good reminder that so much can change in this world when we choose to REALLY live out the love we were commanded to! So let’s jump into our Home (Office) Huddle - Talk about what’s surfacing in our current pursuits—both personally and professionally—as a Husband/Wife duo and this week, our conversations have been centering around the topic of Time. It’s true, and it’s even funny that we’re talking about time a few days before Daylight Savings Day when we turn the clocks back and actually, speaking of changing the time by an hour, you’re a ‘watch man’ - you wear a watch every day and I’d go as far as to say that you feel naked when you don’t wear a watch, true? You have quite the collection of watches, all of which are Nixon brand… I think it’s hillarious that you wore a watch all day yesterday and at 8o’clock last night you realized your watch was still on Colorado time (which was an hour ahead)! So my question is, have you worn that watch in the last week and just didn’t notice? It is true, I don’t know why it feels so exacerbated in this current season but I wonder if it’s just that it’s finally caught up with us… And by ‘it,’ I think it’s all the ‘yeses.’ We’ve had several conversations in the last week or so about the fact that we rarely say ‘no,’ either one of us, and it’s feeling like that lack of boundaries is thinning out our capacity, effectiveness, creativity, joy, our ability to engage, and probably, most affected… our peace. For example, last week I finally sat down and realized that in my design business I was juggling 12 jobs at once - and not 12 good jobs, maybe 3 jobs that were decent-paying and then 9 jobs that were taking tons of my time and each bringing in only a few hundred dollars. And on a lot of these jobs, I’m doing them for small projects or friends/family and I’m realizing I’m devaluing my time or skills and yes there’s the time for my actual skill/service, but then there’s several additional hours of going back/forth in email or on the phone and by the time I’m done with one of these jobs I’m actually not really making that much money for the amount of time I’ve put into it. Well, and if you’re honest, one of the reasons you struggle to say ‘no’ in these jobs is out of fear right? Yeah, if I’m honest, I’m fearful that if I don’t say ‘yes’ I’m not going to get another job and so I overextend myself and undervalue my skills and I’m working like crazy but actually not bringing in the money for all hours I’m putting in, which feels pretty crappy. And here’s the bottom line, I understand there are just seasons of busy, seasons of start-up or wrapping-up where you just gotta put in the extra hours at night to get ‘er done, but what we’ve been talking about is a life pattern where we’ve not protected or valued our time and now we’re not living the life we want to live because we’re saying ‘yes’ to everyone job, every opportunity, everyone who wants meet up for coffee, or everyone who wants some of our time or expertise. And believe me, we are generous people - I love helping people and you, Morgan, you’re a 2 on the enneagram—a Helper—but we’re just realizing that we need to reclaim our time and create boundaries for ourselves by learning to say ‘no’ without feeling like we’re being rude, offensive, or selfish. I think we’re pretty aware that our society doesn’t tell us that we should be investing in time affluence - I know it’s true for us, but on a whole I’d say that Americans in general are always scheduling and filling up every second of our day and collectively answering “we’re busy” when we’re asked how we’re doing or ending days saying things like “there’s never enough time” and “I didn’t the things done that I wanted to today” - would you say that’s true? Tina values time more than money and would rather work less and make less money in order to have time and time off. She’s willing to sacrifice money to have more time. Maggie values money more than time and would rather work more and make more instead of having time or taking time off. She’s willing to sacrifice time so that she makes more money. Why are those who value time happier? Well when you’re working less and having more time, you can actually spend that time engaging in activities that are known to boost happiness like spending time with people, meditating, doing kind acts for others, exercising, traveling or having experiences, and then reflecting on it all and practicing gratitude. All these are known to lead to greater levels (or more injections) of happiness. It’s so much easier said than done, but actually thinking back, ‘No’ was the best advice we got when we moved to Uganda - a business man who’d traveled to Africa several times told us to know exactly what we called to (what we were saying ‘Yes’ to) and then say ‘No’ to everything else, trusting that other people would be called to do those things because we’d be out of time and money with all the need and all the ‘asks’! It was the exactly what we needed and we pulled on that wisdom often during our time living and operating there and now it seems like we just forgot and so now we’re having to go back to that wisdom… almost like flipping the switch and rewiring how we think about the value of time (and ultimately ourselves) in this current season of life. Okay Baby, let us jump with you into the depths… take us on a Deep Dive! It’s been a couple of months since I read a parable on the Deep Dive… so here it goes. There was once a fiery preacher who possessed a powerful but unusual gift. He found that, from an early age, when he prayed for individuals, they would supernaturally lose all of their religious convictions. They would invariably lose all of their beliefs about the prophets, the sacred Scriptures, and even God. So he learned not to pray for people but instead limited himself to preaching inspiring sermons and doing good works. However, one day while traveling across the country, the preacher found himself in conversation with a businessman who happened to be going in the same direction. This businessman was a very powerful and ruthless merchant banker, one who was honored by his colleagues and respected by his adversaries. Their conversation began because the businessman, possessing a deep, abiding faith, had noticed the preacher reading from the Bible. He introduced himself to the preacher and they began to talk. As they chatted together this powerful man told the preacher all about his faith in God and his love of Christ. He spoke of how his work did not really define who he was but was simply what he had to do. The businessman readily agreed, unaware of what would happen. Sure enough, after the preacher had muttered a simple prayer, the man opened his eyes in astonishment. As they parted company the businessman, still confused by what had taken place, returned home. But now that he no longer had any religious beliefs, he began to find it increasingly difficult to continue in his line of work. Faced with the fact that he was now just a hard-nosed businessman working in a corrupt system, rather than a man of God, he began to despise his activity. Within months he had a breakdown, and soon afterward gave up his line of work completely. Feeling better about himself, he then went on to give to the poor all the riches he had accumulated and began to use his considerable managerial expertise to challenge the very system he once participated in, and to help those who had been oppressed by it. And as promised, we said we’d do the random drawing ‘live’ on the recording of the Podcast today, so let’s get to it…. Okay, so we did several posts on Instagram and we combined all those entries into one huge chronological spreadsheet (remember, I’m an Excel junkie) so we’re going to ask Siri to randomly choose a number and then I’ll look down the list for that number and announce the winner…. Alright, are we ready….Siri, please…. WAHOO!!!! Noise! Confetti! Cheers! Congratulations! Yay! You can go to our Instagram page - our handle is @HansowFamily (h-a-n-s-o-w-family) and we’ll post the video of this announcement tomorrow. So fun! No ‘On the Screen’ segment this week, obviously with our inability to manage our time, our time to do fun things, like visit the cinema or watch streamed shows, has been compromised. However I will say you and I did go to a life group we’re in this past Sunday to talk about the movie “The Hate U Give” which we talked about on last week’s episode, Episode 23. There were 10 of us, some of us with black skin and some of us with white skin and we all talked about the film for a few hours. We did a lot of listening as our friends shared their experiences and perceptions and talked about the complications and the issues. And the bottom line is that whether we’re aware of it or not, there is an underlying subconscious bias we have towards people that aren’t ‘the same’ as us. And it’s not just a black/white thing, although for the sake of this discussion, that was the main focus, but really, it was a good discussion and gave us a lens other than our own. For example all our friends of color have shared how offensive and hurtful it is when someone says, “I don’t see color” - I’ve had people say that to me in regards to Jadyn. I understand the heart of what they’re saying, essentially they’re trying to say “I’m not racist, I don’t look at people as different because of their skin color” but the way it’s said, the actual words ‘I don’t see color’ actually make a person of color feel unseen and not valued. Instead we should see color and we should celebrate the diversity. It’s about unity, not uniformity. We don’t want a bunch of the same - we want the uniqueness of the diversity of God’s creation - in skin color, in hair texture, in culture, in personality, in skills. Really it was just so good to be reminded of that and see into the things that we overlook because whether or not we see it or acknowledge it, we really do have a ‘white privilege’ in America and only in hearing the stories of others and choosing to stand up for diversity will we ever see unity in our Nation. And speaking of our Nation, it is our privilege to use our voice - your vote is your voice. Election day is next Tuesday, November, 6th, so please make sure you make it a priority to vote! Yes, follow us on IG: @HansowFamily - If you’re not following us you want to...we’re about to do a HUGE giveaway on Instagram with all things Unicorn and you can only enter on Instagram. “Today’s show has been brought to you by the word ‘’TIME” - It’s time to honestly evaluate your time...where you’re spending it, where it’s going, how’s it being used, and determining if you are feeling valued with your time. We’re learning the hardest word to say it ‘No’ - but it’s only in the ‘No’ that we have the ability to say ‘Yes!’ You can’t have a Yes without a No! No guilt, no shame, no feeling selfish...it’s YOUR time—you only get this one life and you are alone are accountable for how you spend it. So complete freedom today to look at your time and make priorities for what you want and how you want to be used and valued for your time. And remember, Time affluence… you will actually be happier and more fulfilled when you choose to build wealth in time in order to make time for the things that really bring you happiness! It’s time!